Since 1993, Somerset Group Consulting, Inc. (SCGi) has focused on providing management consulting support for contact center managers around the world, with a special focus on the implementation of advanced contact center technology systems. Somerset Group Consulting, Inc. is a certified Minority Business Enterprise by MD/DC MSDC. Our “real quote pricing” policy for projects ensures that we are within budget and provide deliverables on time. Our services will make your contact center the best in class. 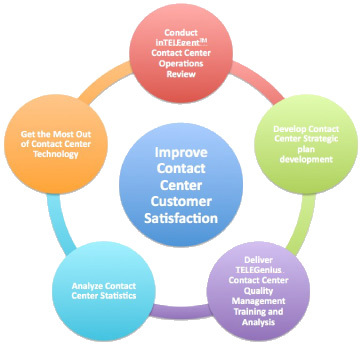 Contact center implementation using callcenterGeniusTM Management Solutions – SCGi uses our proprietary callcenterGeniusTM Management Solutions to provide our clients with a strategic operations plan at the beginning of a project. We design and provide the layout of the proposed contact center to implement cutting-edge technology solutions that improve client performance. Assessment of quality management & performance improvement procedures – When SCGi begins a project, our clients can be sure that we will take the time to analyze their current processes against industry-accepted performance metrics, identify areas of risk, and provide solutions to address areas of concern. Our callcenterGeniusTM Operations Analysis Process drives more efficient performance with a high level of quality to improve customer satisfaction and employee performance. Design of contact center methods and procedures – We have years of experience designing and implementing training programs and quality-assurance procedures that work to ensure that our clients provide world-class services to their customers on every call. Some of our training courses include One-Call Resolution Training, Discussion Skills, and Problem-Solving for Managers and Agents. Technology expertise – We are experts in contact center technology and have developed in-depth knowledge of cutting-edge contact center technology. We work with you to identify technological solutions that will enhance your operation to further improve efficiency and productivity. The Call Center Mini-Review provides insight into call center staffing, actionable decision making data, technology needs, and other critical areas of call center operations. The call center mini-review is completed by call a center expert and results in confidential analysis document. Our only objective is your success. We accomplish this by delivering the highest-quality management consulting on time and within budget. Our consultants and processes are proven and ensure that you only pay for the services you need.